” President Donald Trump’s Week 7 in Office – Signs of a New Low ” – March 6 – 10, 2017. 1. President Donald Trump’s accusations of wiretapping the Trump Tower against the former President Barack Obama without concrete evidence. Immediate impact : Barack Obama’s exasperation and irksome reaction causing a negative impact on the credibility of the President. 2. Wikileaks’ publication of documents detailing CIA hacking tools. Immediate impact : Julian Assange, the Wikileaks founder, has resolved to work with Apple and Google on the technical details. The engagement of the two tech giants is beset with hurdles, regulatory, moral .., though. 3. President Donald Trump’s new Healthcare Plan in the nature of repeal and replacement of Affordable Care Act, having crossed two House Committees successfully with a full House vote scheduled for Thursday, and his move to garner the support of the lawmakers with meetings and the people through rallies planned for the future. Immediate impact : The success of this will besides taking the stress away from the President will signal his victorious march to work on his other promises on Tax Reform, Trade deals, Infrastructure development, Jobs and Growth. 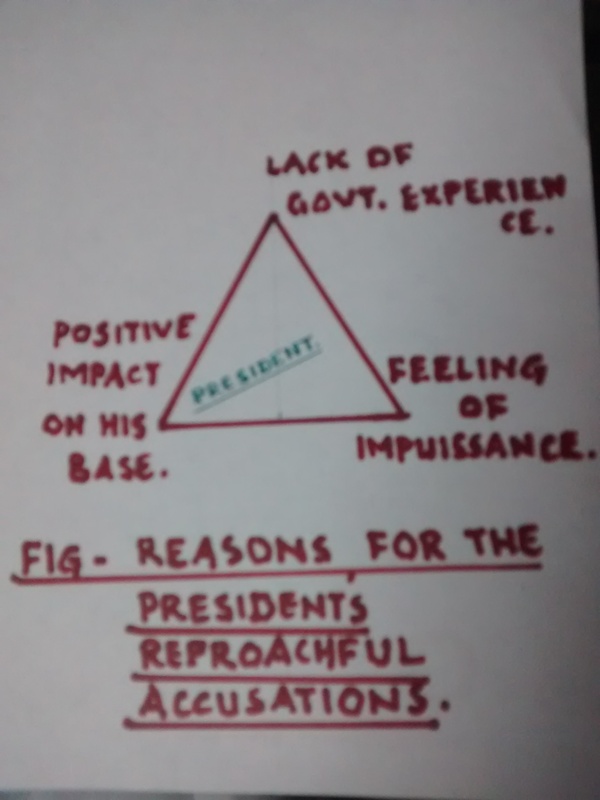 The Figure above presents the Possible Reasons for the President’s reproachful accusations viz. (a) positive impact on his base, (b) feeling of impuissance, and (c) lack of government experience. (a) Positive Impact on his Base : Rather than promoting a healthy debate/discussion with cognizant thinking, the President’s accusations and tweets seem to reconcile well with the opposing views held and voiced during the Election Campaign and later, with his supporters (solidly behind him) who strongly felt their voices were not heard but their bounds were marked with firm poles blocking any vocal expression. Frequent doses of such criticisms combined with the unshifting stance of supporters will, nevertheless, make an impact that can neutralise any resistance his opposition may engage in stalling the programs/initiatives. This is not justifying the accusations in any measure, but pointing to the response in terms of human element. Hence the barrage of accusations and tweets, whether the course is right or not. 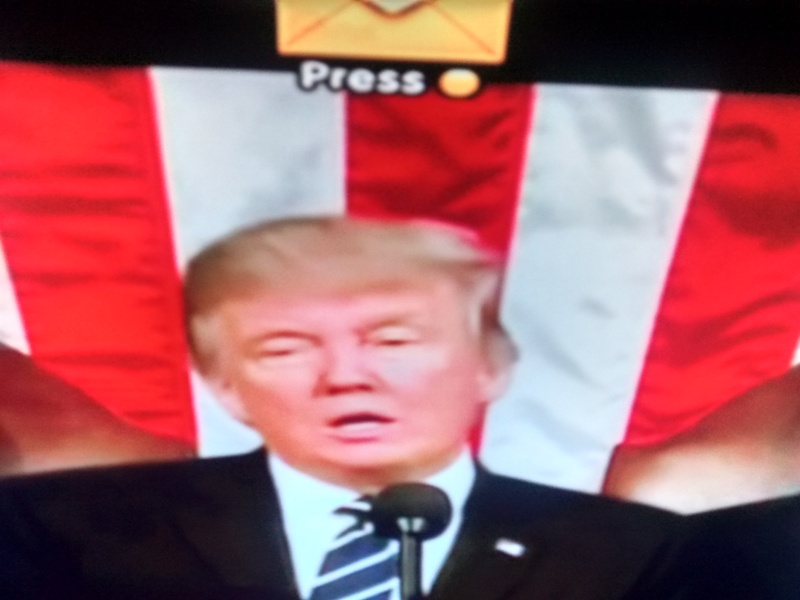 (b) Feeling of Impuissance : President Donald Trump’s intense and excessive work schedule; information overload arising out of the formulation of programs and execution; aversion to criticisms; probable suspicion that opponents are trying to delegitimise his victory – if they are real – can make him feel powerless driving his actions to embitter relationships with people further. As a remedial measure he may be resorting to change the attitude of people in terms of enhanced support and spirit in a manner that he regards most appropriate and adept at. This is not justifying the accusations in any measure, but pointing to the response in terms of human element. Hence the barrage of accusations and tweets, whether the course is right or wrong. (c) Lack of Government Experience : President Donald Trump’s actions including his First Executive Order on Travel Ban have not been perceived to be in order by a majority even as he remains self possessed. His critics have been quick to grasp eagerly and forcibly his lack of experience in governance as the chief cause of errors in actions. It has been a jolty shake and shock for him. It may have even resulted in mental and emotional stress. Obvious countermeasures in such situations for any human being is to display aggression and set the blame on factors beyond his control, logical or otherwise. The speculative theories engaged in and propagated through his actions may well be an exercise reinforcing this aspect of human psychology. Conclusion : What is being discussed and discepted in the media ( TV, Press, News magazines … ) have become easier, faster, and highly prevalent on-line ( Social Media with high potential to mold the public opinion) as in the real world in this new millennium. Tweets of President Donald Trump ( without analysing the merits, exploitation, faults etc.) are a modern tool to arouse and tackle the ills of society. The dividends that President Trump reaped during his Election Campaign went missing, but the vulnerability that he is facing now has become serious and get highlighted prominently. Public anger will be intense if things do not improve for the people from the President’s programs. Hence, the long term impact, negative as it is most likely, will be more damaging even if the short term responses do not much reflect the challenges in reality. Social technology has actually transformed the Election Process since 2008 progressively, and its potential to bring down leaders may well be in the making. Immediate ‘corrective measures’ and not ‘complacency’ is the urgent imperative.